Was Hitler Really a Dictator? - Table of Contents; by Friedrich Christian, Prince of Schaumburg-Lippe. "I ask myself what other ruler was ever as celebrated, as revered, as loved and idolized as this man in the brown shirt..."
Translated by Victor Diodon and published here by kind permission of the copyright owner. Translation © 1998 by The Scriptorium. 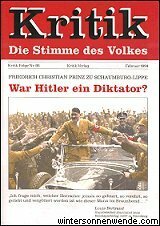 Was Hitler Really a Dictator?